All companies like to emphasise their human side so that they can be seen to connect with their clients. Unfortunately, being human is the main problem when considering cyber safety. Nobody is perfect; we all have failings, and that is what makes us human. But the most important aspect for businesses is that we need to prevent those failings leaving us open to cyber attack. Hackers are constantly trying to find ways to get into secure systems, and human error is the easiest avenue for them to exploit. Employees should be made aware that there are a number of procedures that they should follow to ensure they are not ultimately responsible for an attack. Email and mobile phone texts are the most common way in which hackers will try to steal information. They may be impersonating another individual, sending a rogue link, or trying to steal passwords. If a member of staff suspects that an email does not come from a trusted source, they should hover over the ‘from’ and ‘reply-to’ addresses to see if they are from valid domains. Although some emails purport to be from one address, hovering over it should bring up the real source address. This should be second nature, but it becomes even more important if the email asks for passwords or financial information. Many compromised firms are finding that an email asking for vital information had been made to look like an internal mail coming from management. For safety, requests for such information should always be verified with the purported sender just to double-check the veracity. Clicking on any link, whether in an email or sent by text, should be very carefully monitored. This is the simplest way for hackers to infect a system with a virus, but hovering over it should expose the actual destination of the link. Passwords are another contentious issue. As technology pervades almost everything we do, the number of passwords an individual has to remember is increasing. This has meant a rise in people using the same password for both work and in their private life. When one of these is compromised, everywhere else with the same password is also at risk. Employees should be made aware of this security aspect and ensure that their passwords are not duplicated. A company can also help tighten up security if they pay attention to the day-to-day practices of their employees. Sometimes shortcuts are made to enable them to carry out their job more effectively. It may seem to make sense for staff to share passwords, or to leave rooms or drawers unlocked so that they can work faster. All of these can compromise security; solutions have to be found so that the employee is productive and the business secure. What are the consequences of a cyber incursion? If your security is undermined and hackers have gained access to your system, your business can be severely compromised. Your data is at risk, and your standing with customers can be permanently ruined. So what can you do about it? The important first step is to have a plan that will protect your data and information from any unauthorised incursions. This is where an IT managed services company like IT Force can come into their own. A security plan will assess your risks, decide how you deal with them, and make sure there are no gaps in your security practices. IT Force are well-versed in cyber security. They can help you stop many of the attempts on your systems, as well as provide safer encryption and protection for your data. Need more? 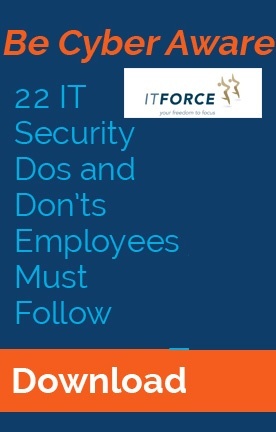 You can download our full IT Security Dos & Don'ts eBook by clicking here.